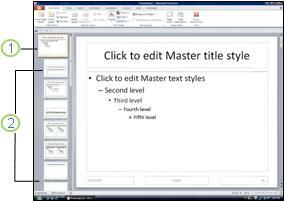 PowerPoint can number your slides for you automatically, but it can't automatically show a count (such as "slide 2 of 12") for you. You have to do that kind of count manually. This article describes how. On the View tab, in the Master Views group, click Slide Master, and then click the slide master thumbnail. On the Insert tab, in the Text group, click Text Box, and then drag to draw the text box where you want the slide number to appear on your slides. With the cursor still in the text box, on the Insert tab, in the Text group, click Slide Number. In the text box, place your cursor before the <#>, and then type Slide. On the left pane that contains the Outline and Slides tabs, click the Slides tab. 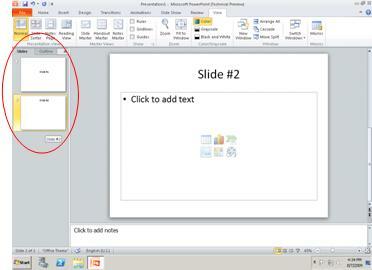 Look at (or scroll down, if you have a longer presentation) the last slide thumbnail image on the Slides tab. The thumbnail images are numbered (just outside the upper left corner of each), so the number of the last slide thumbnail is the same as the total number of slides in your presentation. Place your cursor after the <#>, and then type of x , where x equals the total number of slides in your presentation (for example, <#>of 10if you have 10 total slides in your presentation). Numbering slides this way does not calculate the total number of slides in your presentation automatically, so you’ll need to enter the total manually, in place of the x. If you later add slides, you’ll need to update the total manually as well. If you want to see how the numbering looks on your slides, view your presentation in Normal view. On the View tab, in the Presentation Views group, click Normal. Note: Because this procedure adds slide numbers to the slide master, the slide numbers can't be deleted from or edited in individual slides and they won't appear in the Header and Footer dialog box. On the View tab, in the Presentation Views group, click Slide Master, and then click the slide master thumbnail. Place your cursor after the <#>, and then type of x , where x equals the total number of slides in your presentation. If you want PowerPoint to be able to include the total number of slides, go to the PowerPoint Suggestion Box to vote for this idea.